Visiting Berlin by car? Wondering where to park your car? If you travel to Berlin by car, you probably sooner or later ask yourself “Where can I park my car? And how much does it cost?”. On this page I’ll try to give some answers to these questions. First things first: there are actually still many free parking spots, or actually rather free parking areas available in Berlin. In most of the outer city districts you can just park your can in the street and don’t have to pay. But on the other hand this also means that in almost all of Berlin’s inner city districts you will have to pay to park your car. On this page you’ll find some basic information about how and where you can park your car in Berlin, how much it might cost you. Where to park your car for free – and how and where you better don’t park your car at all. If you look at a Berlin map, actually only a relatively small area of the city, the inner city area is not free to park. So if you are looking for a long term parking spot, probably the cheapest (actually free) and easiest option would be to park your car in one of those cost free areas. So first you should get done what you need to get done. Drop those suitcases or the extensive grocery shopping at your apartment – and then leave your car in one of the free parking areas – outside the area, where parking is not free. Trust me – it’s worth to take the extra ride and park outside of the ‘Parkraumbewirtschaftungszone‘. And the good news is: you probably don’t have to look far for a free parking spot. There should be almost always be some area nearby where you don’t have to pay any parking fee at all. Then you just take the public transport or a taxi back to your place. Often you don’t even need to take neither public transport nor taxi since chances are that the distance would not be too great – so you can also just walk back to your place and maybe discover some of your neighborhood streets on your way. The City of Berlin has released a map tool, pointing out where you would have to pay to park your car – and how much is charged by the hour. It also points out, where you don’t have to pay anything. Depending on the borough, area, or even street the fees go from 1 Euro per hour to 3 Euros per hour. Alternatively you can check this Google Map where basically the same information is provided – probably much easier to navigate. 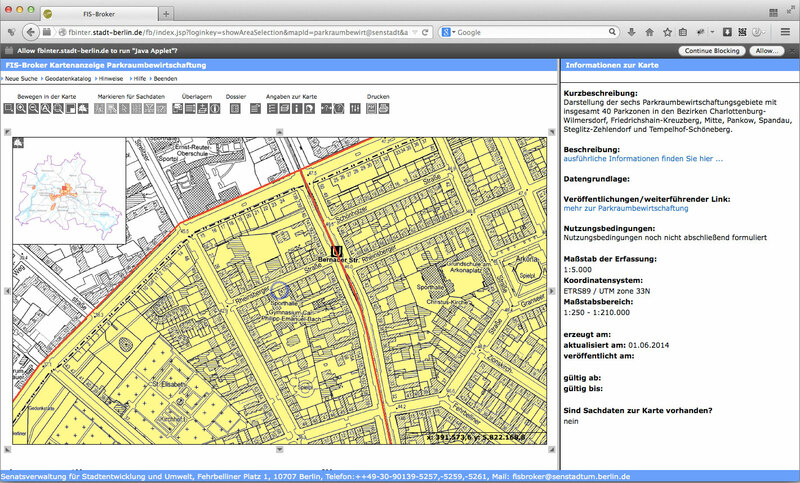 How to use the Parking Map Tool? The map tool may first appear to be a bit complicated. The user interface is not really intuitive – but actually the map tool is a very complex application and you could also look for all kind of Berlin related data like unemployment rates and the like. If you just want to see where you’d have to pay, and where the free parking zones are located, all you have to do is enter an address and then navigate the map. Below are some screenshot. First enter the street (‘Straßenname’), the street number (‘Haus-Nr.’) and the postal code (‘Postleitzahl’) into the fields on the right side of the tool. 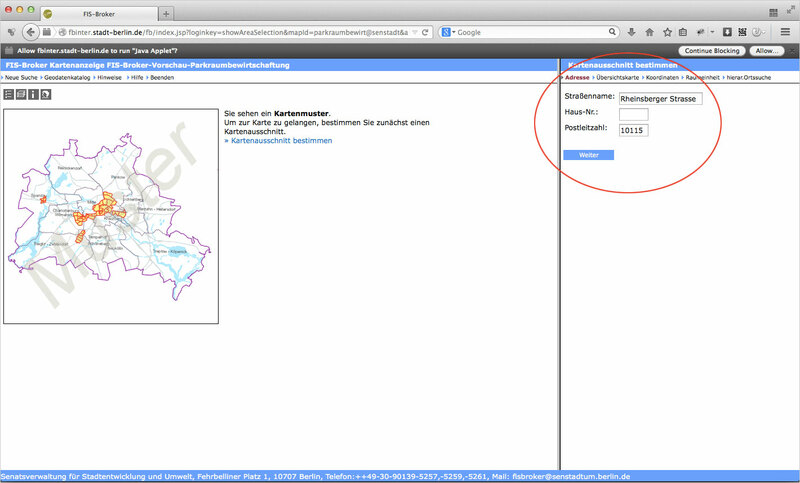 Then hit enter (‘Weiter’). On the following screen you’ll see the address you just entered. In the zones marked yellow you’ll have to purchase a parking ticket. The blank areas are free of charge. It might be worth checking these maps before you actually park your car over a couple of days. Why pay, when you can park for free just a couple streets or blocks away? They may be a bit hidden, but of course there are also parking garages available in Berlin. Some are underground garages like the one at Alexanderplatz, near Park Inn Hotel – or the one underneath Kulturbrauerei in Prenzlauer Berg. At Alexanderplatz full-day-tickets are available for 24,- Euro (per 24h). Here is a comprehensive list of public parking garages in Berlin. Some Berlin Hotels offer reserved parking areas for theirs guests. So if you are planning to stay at a hotel, chances are that there may be an additional option available. And even if you are not staying at a hotel yourself, it may still be worth asking at a hotel near where you are stying if they have parking lots available. Some hotels may actually welcome you and your car or motorcycle, even if you are not their guest otherwise, because for them a rented parking lot is of course better than an empty parking lot. For Berlin residents there are long term tickets available. If you are actually moving to Berlin you should check this option. A residential parking permit is valid for up to 2 years and will cost you some 20,40 Euros (as of December 2015). If you or a friend / family of yours is not a resident, but visiting Berlin temporarily – and you need a parking permit for a couple of weeks, then a so called “Gästevignette” (guest vignette) could be useful. These temporary parking permits can be ordered by any local Berliner that is officially residing in Berlin, meaning that she/he is officially registered at the same address, as you need the guest vignette for. So if you are only visiting for a couple of days or weeks, you will actually have to ask a local resident (for example your host, your flatmate) to buy a “Gästevignette” for you. The Visitor is not registered in Berlin. There some spots and areas where you should definitely NOT park your car, unless you want to have it towed away. Parking in a driveway for example may sound tempting, but it’s not a good idea – even though driveways often look like free parking spots. Some driveways may however be not in operation and it’s totally ok to park there. in front of a sign saying “Parken Verboten” or “Einfahrt freihalten” or “Durchfahrt freihalten” or anything with “freihalten” – this just means that this driveway or spot should be kept ‘free’ and it is generally forbidden to park here – for whatever reason. 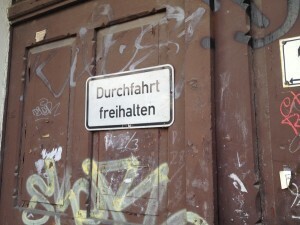 in front of a sign saying “Feuerwehrzufahrt” – this means parking here would block a route used by fire fighter in case of an emergency. on a handicapped parking / disabled parking space, often marked with a symbol representing a wheel chair. In Germany we distinguish between two different types of ‘parking a car’: shorter ‘stop’ “halten” may still be ok even in spots where parking “Parken” is forbidden. So who is who – what is what? Rule of thumb: if you happen to pack things in or off your car, could be also fellow travellers, then it’s ok to stop for about two minutes. 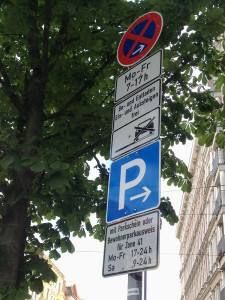 There are even street signs that indicate zones where you may stop for two minutes – the signs are called “Parkverbot” (parking forbidden) or sometimes “Ladezone” (loading zone). Often these spots are marked by a red circle, blue background, and just one red bar crossing the circle. First of all: this is a great opportunity to learn another very german, but quite useless word: “Parkraumbewirtschaftung” – which means something like “economical cultivation of parking lots”. You will notice you are in an area where the parking space is economically cultivated by the armada of signs and ticket vending machines – and those little ‘bills’ stuck behind some cars’ windscreen wipers. In these areas parking fees vary between 25 cents for 15 minutes (or 1 Euro per hour) up to 1 Euro for 15 minutes (or 4 Euros per hour. In some areas night time parking is free of charge, other areas are ‘harvested’ 24/7. The ticket vending machines may look a bit complicated – so I put up a separate page that explains the basics of how to use a Berlin parking ticket vending machine. Moving? Need to reserve a parking zone? In case you are moving and you need to have some space for the truck in front of your door you can actually reserve a spot in the street. Usually you would have to ask for such a parking zone two weeks in advance – and there is some paper work to be done – and you would also have to borrow the signs from somewhere. But in most cases / for most people this would probably be a bit too complicated. Instead you can also either ask the moving company – in case you are hiring one. Or you ask a service that can make that reservation and put up the parking signs for you. For a one day reservation for a loading area 20m wide you would probably have to pay something around 75,- to 100,- Euro. 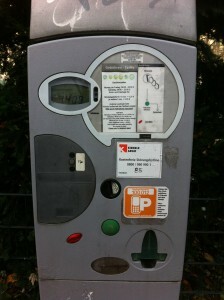 How to use a Berlin parking ticket vending machine. Got further questions about Car Parking in Berlin? How do I get a “Gästevignette”)? I’m trying to find out how much distance you have to leave from the driveway (residential area-Berlin Nikolassee) when you’re parking on the street in front of the residence. This particular street parking has the 2 wheels on the curb parking. that is indeed a bit tricky question. Basically the driveway should be marked with cobblestones or the like – and the cars parked in the street should not block the pathway, if it would continue into the street. That would mean, that you could actually park your car quite close to the parkway. BUT the law also says that it depends on the situation: if the street happens to be quite narrow, then the cars in the street should be parked so that the person entering or leaving the driveway would not be forced to maneuver back and forth. As far as I know the law even considers maneuvering one time not a problem – but if the person entering or leaving has to go back and forth several times then it is considered “blocking”. This is of course a rather vague definition – and in the end it would probably be necessary to call the police if you really wanted to prove that a car was blocking or not blocking a driveway. So in the end it is basically up to you: do you think somebody with average driving skills would be able to enter/leave the driveway? Then it should be ok. I hope that helped to clear the unclear a bit? We are planning to stay at a hotel in Berlin and need to park our RV while in the city. Hotel parking won’t work due to height restrictions but I am wondering if there are won mobile restrictions in the free parking zones in the city? no, there are no ‘general’ restrictions concerning parking an RV, a caravan or a trailer in the street. So – yes, In all Germany (so also in Berlin) it is allowed to park your vehicle for up to two weeks. You could basically park your RV wherever you want –that is *in the street* – and of course only if there are no other restrictions. “Other restrictions” would then be indicated by no-parking signs. You would actually even be allowed to sleep in your RV for one night to “restore the ability to drive” – but I suppose you are not planning to do so anyways. Have a save trip and a nice stay! Could you please advice a parking near Berlin outside “umweilt zone”. My car is Euro 3 diesel – not allowed inside. We will have half a day in Berlin (plans are to take tour bus and thats all). in Berlin it’s rather easy to recognize the “Umweltzone” – at least once you know what to look for. :) The Umweltzone is bordered by the S-Bahn-Ring – so everything inside the S-Bahn-Ring is inside the Umweltzone, and outside the S-Bahn-Ring is outside the Umweltzone… So you could basically park anywhere outside the S-Bahn-Ring… Hope that helps? Thank you for this clear info! Wow, that is amazing that so many places in Kreuzberg and Friedrichshain are still free of charge for parking. I wonder for how much longer. Dears, please could you advise me? On Monday night I have parked on Auerstrasse 16, Friedrichshain. There were no signs as I would be aware off and tonight (Wednesday) when I got to pick up my car it was not there. I called police and they told me it was towed for wrong parking. More details I will find out tomorrow at the police station on Wedekinstrs. I will also ask them to provide me a written reason, why my car was towed. Tonight, there is another car parking, at exactly same spot. I have Czech licence plate and I entered the city with yellow vignette no.3. I know it is not allowed, but I needed to get in. Please let me know, whether this is reason it could be towing my car. Thanks a lot. I have had my household belongings shipped from Canada to Berlin and they are arriving soon. The shipping company just told me that I need to arrange for parking for their delivery truck. The truck is 12 meters long and 18 ton. I live on Schönhauser Allee and the stretch of street outside our building is marked as a loading zone, with paid parking on either side of the loading zone. The delivery company is unable to give me an exact arrival time- just a time frame of 8am-6pm. Is it possible for me to reserve the loading zone or something? I’m really at a loss of what to do here. Even if the stretch of street in front of my building was paid parking, how would I go about organizing parking for a large truck with no definite parking time? Does this all make sense? :) thanks in advance! Sorry it took me some time – hope it’s not too late yet! I did a quick research on the matter and added the info to the article above. The short answer: you can hire a company that would put up parking signs for you – but you should book such a reservation already two weeks in advance… Hope this helps! Cheers! And welcome to B! Could you help us, we are going to visit Berlin in summer. But we can’t get a green environmental zone sticker to our car. Where is the nearest & safest place to park our car outside the zone, when we are staying at the hotel in Oranienburger Straße? as described above the Umweltzone is bordered by the S-Bahn-Ring – so everything inside the S-Bahn-Ring is inside the Umweltzone, and outside the S-Bahn-Ring is outside the Umweltzone. If I was you I would probably park my car near S-Bahn and U-Bahn station Wedding – just outside the Umweltzone. Taking the U6 this would only be 4 stops from Oranienburger Strasse / U-bahn Station Oranienburger Tor. You should be able to find a free parking spot in some side street around Müllerstrasse / Reinickendorfer Strasse. Is it safe to park in that area? Probably just as safe as anywhere else in Berlin. However you should probably not leave any precious objects lying around the car – but I guess that’s rather obvious. Have a safe travel to Berlin – and a nice stay! Sorry that I reply only now! And I’m really sorry to hear that your car was towed away – probably quite a bad and expensive experience. I actually have no clue why this happened. Have you found out, what the reason was? As far as I know having the wrong Umweltplakette should only result in a fine – but it should now be a reason to be towed away… Best wishes! thank you very much for the effort! ANd thank you for sharing your map here. I also think your map looks much more handy and easier to use than the official ‘parking zone tool’. Nice job! Hi I am visiting Berlin in a few weeks we have hired a car from the airport and will be staying in a hotel 40 mins from the centre. We would like to drive to the centre near Alexander platz or the Brandenburg gate basically anywhere central and park our car in a car park that we can pay for the day any ideas where we could do this? My family of 5 is staying in Berlin Mahlsdorf at the end of our road trip through Germany. We have a rental car and would like to park for free (Berlin Wall Memorial, Reichstag Building, Typography of Terror, Brandenburg Gate, Checkpoint Charlie, East Side Gallery, etc) and take public transport. Where do you suggest we park for free and what public transport do we take? How much would public transportation cost for 2 adults, 3 children (18, 15, 12 year olds). Would it just be more cost efficient to drive into town and park in a parking garage? Thank you very much! I am of course not 100% sure – but I suppose parking at a Berlin Park & Ride station is free. The P+R Alt-Mariendorf (like all other stations as well) is well outside the area, where there is a parking fee. So even if P+R Alt-Mariendorf would cost something, ou would still find free parking near by. On the top it does say “Free for 2 Hours” but further down under the section “Preise” (prices/fees) it says “24/7 free of charge” (Mo-So – Ganztägig – Kostenlos) so I suppose it’s free. 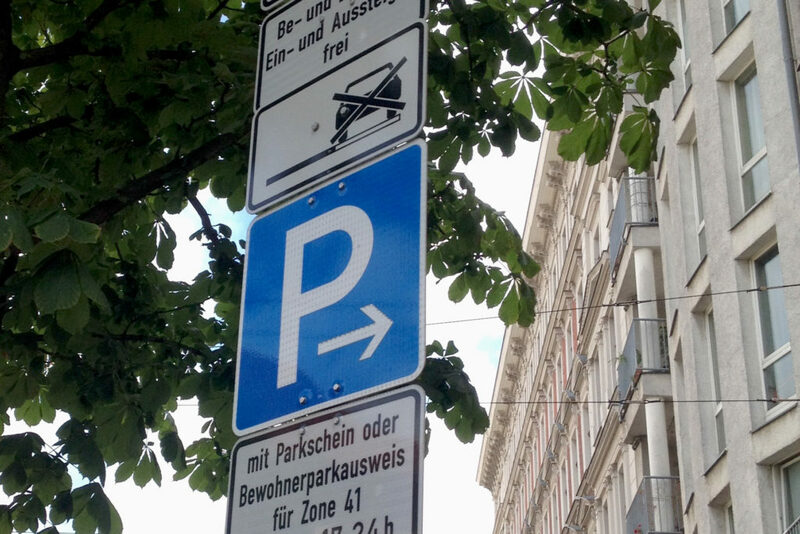 I`m wondering what does parking sign with subsign “mit Parkschein” mean. I can park with parking ticket from parking ticket vending machine, nothing else? Thank you, again ;) Have a nice day!